A barter system is an old method of exchanging goods and services without using a medium of exchange, such as money. Although the system of barter may seem outdated in this day and age, it is an alternative solution for individuals and organizations who are just starting off and want to minimize their expenses. In a time when there was no money and coins, people used barter and trade. This kind of exchange started at the beginning of humankind. Bartering, or a system of trading, was around centuries ago before the existence of cash. Its recorded history goes all the way back to 6000 BC introduced by the tribes of Mesopotamia and spread to the Phoenicians who bartered goods at city ports around the Mediterranean. The system grew across many nations as agriculture also developed and people used goods such as spices, crops, wheat in bartering. Some ancient civilizations even used human skulls and animal fur for trading. Bartering became popular again during the Great Depression in the 1930s to obtain food and services without involving money. It was done between people and groups who acted similarly to banks. If items were sold in barter, the seller would receive credit from debiting the buyer’s barter account. Today, barter and trade have made a comeback in the business industry using methods that are more sophisticated; for instance, the Internet. There are many online platforms and swapping sites that support barter and trade between entrepreneurs. Let’s Barter, Barterkiya, and BarterDaddy are some of the first bartering platforms in the market. Today, you can find various exchanging sites to find the right one to meet your needs. When you choose to barter to meet your current needs, you can save your business’ available money for other purposes. According to Sandeep Soni of Entrepeneur.com, bartering helps extract the maximum value of your goods as a consumer and your skills and services as a business. Another good thing about bartering is its function amidst economic crisis. For instance, Venezuela’s recent economic collapse has pushed the Venezuelans to rely on bartering for basic transactions such as exchanging food for medicine. Bartering also enables small businesses and startups to minimize expenses when the budgets are pretty tight. On the other hand, difficulties and confusion may arise between traders when the value of the items for negotiation is not equal. For example, an entrepreneur may want to exchange his unused desktop computers for high quality and brand-new printers. Moreover, since bartering are not exempt from taxes, problems may occur when an entrepreneur jumps into bartering without knowing the tax laws on bargaining. Although using money for trade simplifies transactions and bartering is not something that any the economy relies on entirely, this system still proves to be a great alternative for business startups and businesses with limited financial resources. 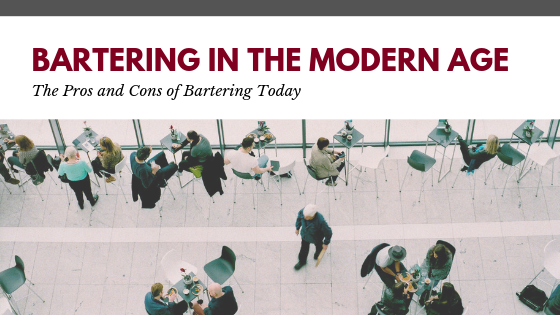 Despite its limitations, modern–day bartering proves to be useful and can be a great help to both individuals and organizations.